America’s great transcontinental railroad was born of the dreams of visionary men such as Theodore Judah, Grenville Dodge, and Abraham Lincoln; and built by the relentless toil of thousands of American, Chinese, and Irish workers. 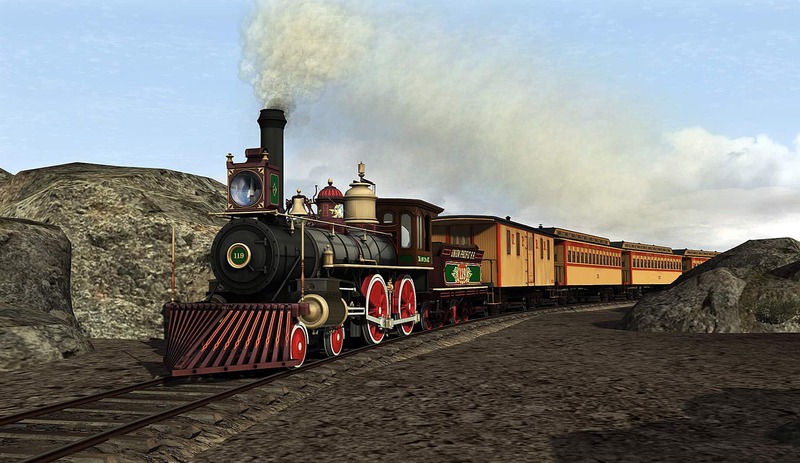 And now, all the remarkable spirit, glory, and challenges of America’s 1869 transcontinental railroad comes to Train Simulator with the 68-mile Promontory Summit route from Smokebox! During the mid- and late-1860s, the Central Pacific (later to become the Southern Pacific) and Union Pacific built east from Sacramento and west from Omaha respectively, with each road energized by the promise of financial rewards and government land grants based upon the miles of road they each constructed. In the early months of 1869, the CPRR and UP track-laying crews raced toward each other north of the Great Salt Lake in desolate Utah. In April 1869, it was agreed that the point of bonding of America’s transcontinental rails would be at the 4,900-foot summit of the Promontory Range. And thus, at 12:47 p.m. on May 10, 1869, the railroads – and America – were joined during the historic “Golden Spike” ceremony, with Union Pacific 4-4-0 No. 119 and Central Pacific’s “Jupiter” “facing each other on single track. The new Smokebox Promontory Summit route re-creates the historic landscape over which this remarkable railroad drama occurred, with 68 route miles extending from Corinne, Utah over Promontory Summit and along the north shore of the Great Salt Lake to Kelton, Utah. 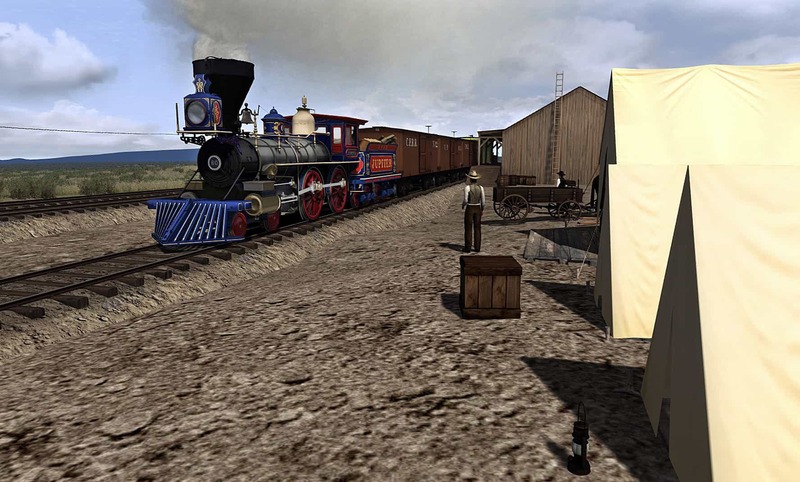 Set in 1869, the route is a remarkable Train Simulator re-creation of 19th century American railroading and its “Old West” environment. Rugged, remote country, tough grades, spindly trestles, and the rough-and-tumble “tent towns” that dotted the newly constructed transcontinental line all come to captivating life in the Smokebox route. Centered on Promontory Summit, the route includes segments of the railroad as originally operated by Central Pacific and Union Pacific, and thus provides a perfect and highly authentic setting to put Smokebox’s extraordinary assemblage of period steam power – which includes Central Pacific’s 4-4-0 “Jupiter,” CPRR’s 4-6-0 “Buffalo,” and Union Pacific’s 4-4-0 No. 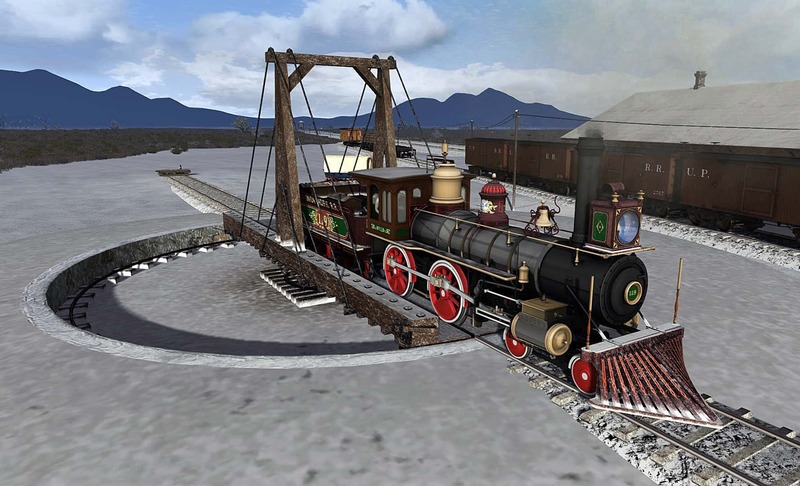 119 types (all available separately at the Steam and Dovetail Games stores) – to hard work hauling passengers and tonnage. 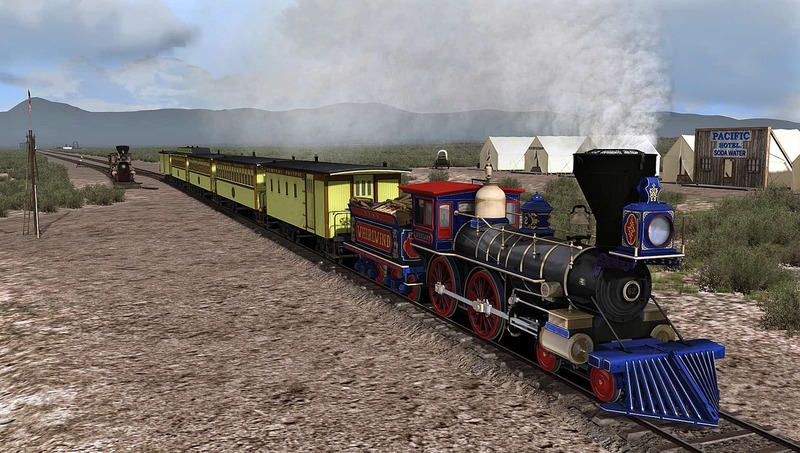 Smokebox is renowned for creating Train Simulator locomotives and routes with extraordinary fidelity to detail and authenticity, and the Promontory Summit route is another outstanding accomplishment by the masterful Mike Rennie. 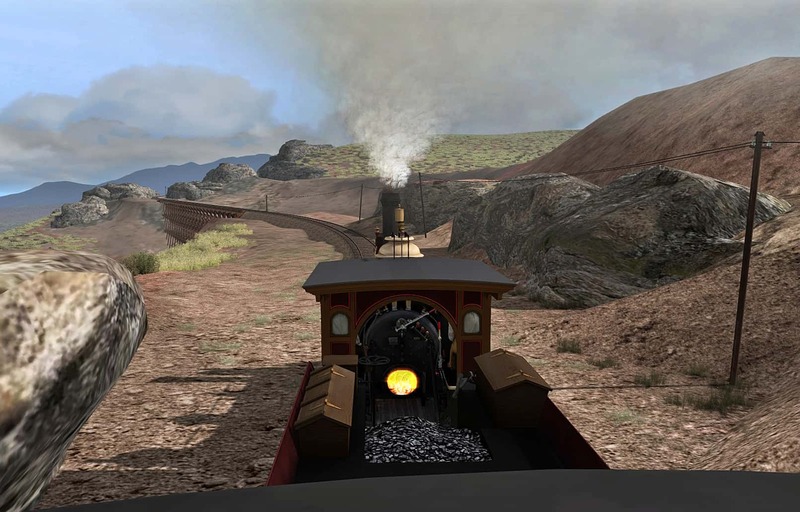 Along with the beautifully crafted route, this Add-On includes ten career scenarios and three free-roam scenarios in which you can go to work at the throttle of CPRR and UP 19th century steam power. And among the career scenarios are two scenarios which together provide an end-to-end “guided tour” of the route and its remarkable history! ...in order to purchase this route. The route is offered with a 20% discount if purchased as a bundle with one of the above loco add-ons. 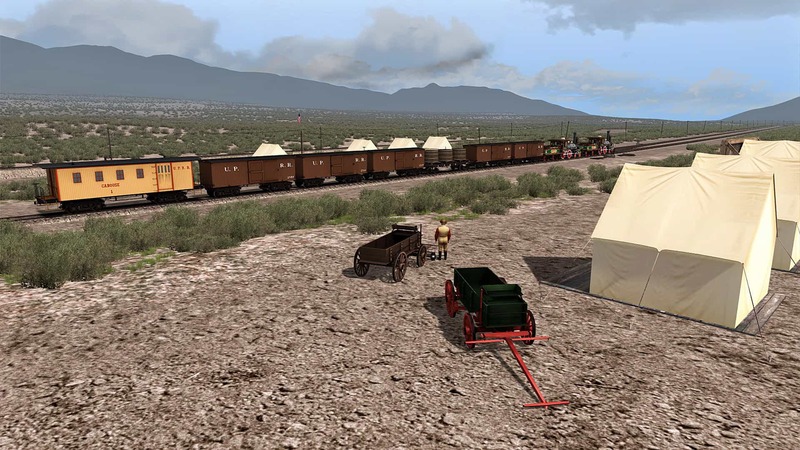 The remarkable frontier spirit and challenges of the 1869 transcontinental railroad now come to Train Simulator, with the new 68-mile Promontory Summit route from Smokebox! At historic Promontory Summit, Central Pacific 4-4-0 “Whirlwind” (above) clanks into town with eastbound passengers, while on another day a Union Pacific double-header eases to a stop at the 4,902-foot-summit of the Promontory Range (below). Screenshots by Gary Dolzall. 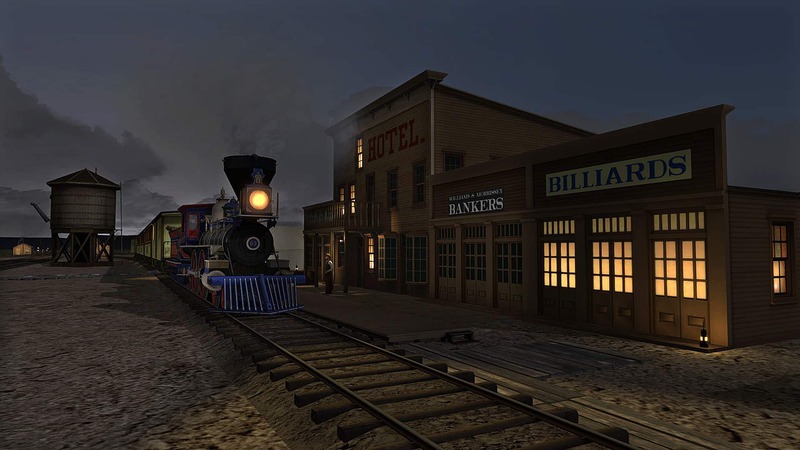 Extending across the rugged and remote 68 miles from Corinne, Utah over Promontory Summit and along the north shore of the Great Salt Lake to Kelton, Utah, the Promontory Summit route features 19th century American railroading and its enthralling “Old West” environment. At Corinne, Union Pacific 4-4-0 No. 119 of Golden Spike fame, eases off the turntable. Note: Screenshots may depict content while still in development. 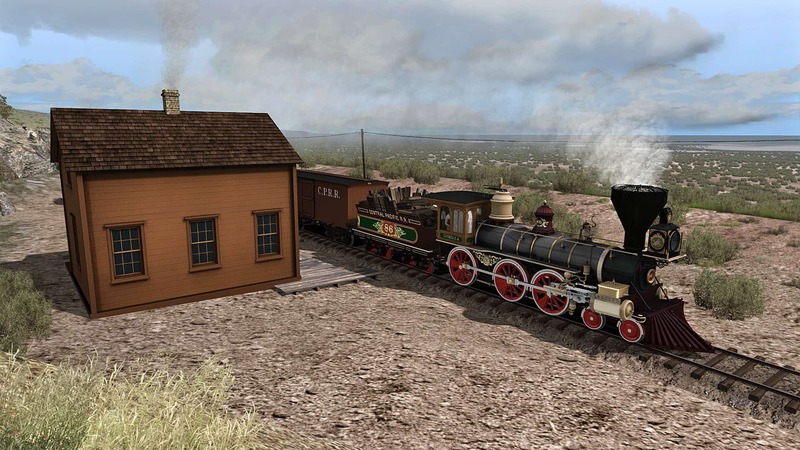 *At the eastern foot of the Promontory Range, the town of Blue Creek served as an important site for construction and operations during Union Pacific’s final push toward Promontory Summit. At Blue Creek (also called Dead Falls), Union Pacific 4-4-0 No. 116 is beginning a westward run with a supply of water (above), while sister No. 119 (below) slowly chugs between the lines of tents that typified towns along the railroad at the time. The transcontinental railroad’s east slope path over the Promontory Mountains was steep, rugged, and unforgiving. 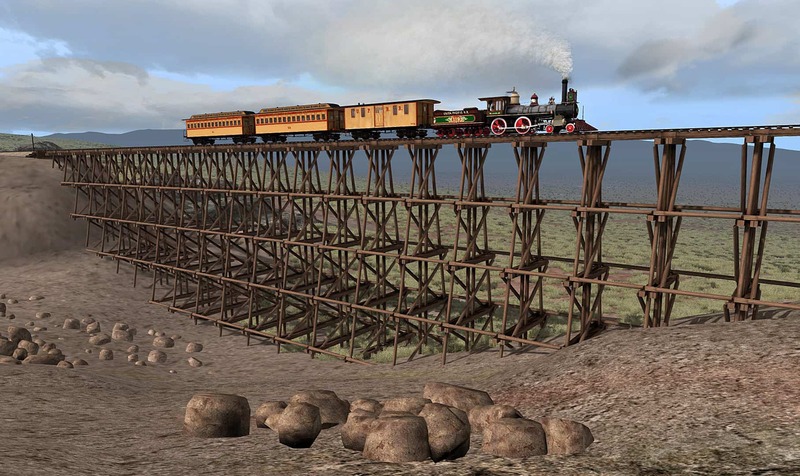 The dominant landmark of the Promontory Summit crossing was the Union Pacific’s “big trestle.” Standing 400-feet long and 85-feet high, the wooden trestle was impressive (and a bit daunting), whether seen from the view of a brakeman riding atop a railcar (above) or from lineside (below). 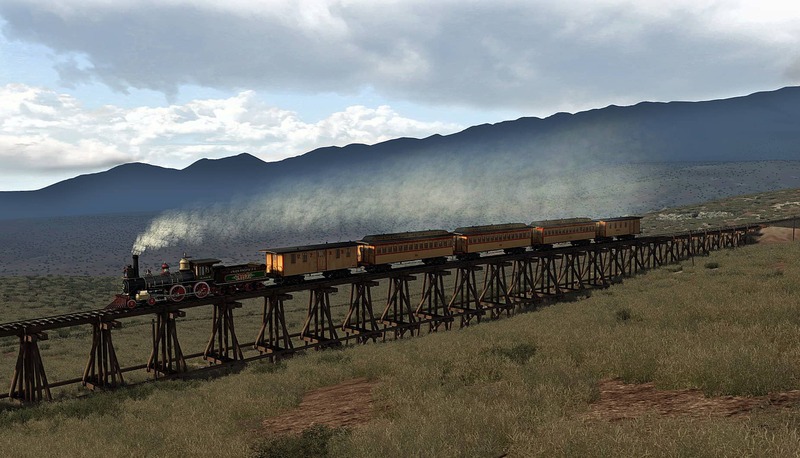 The “Big Trestle” was certainly not the only such structure on the line in Utah, and the new Train Simulator Promontory Summit route features countless wooden trestles of all sizes. Rolling down the desolate east slope of the Promontory Range, a Union Pacific passenger train looks rather like it is clinging to the edge of the known world (above). Cuts (below), sheered through rock by the toil of men’s muscles and black blasting powder, also dotted the transcontinental railroad’s path across the West. 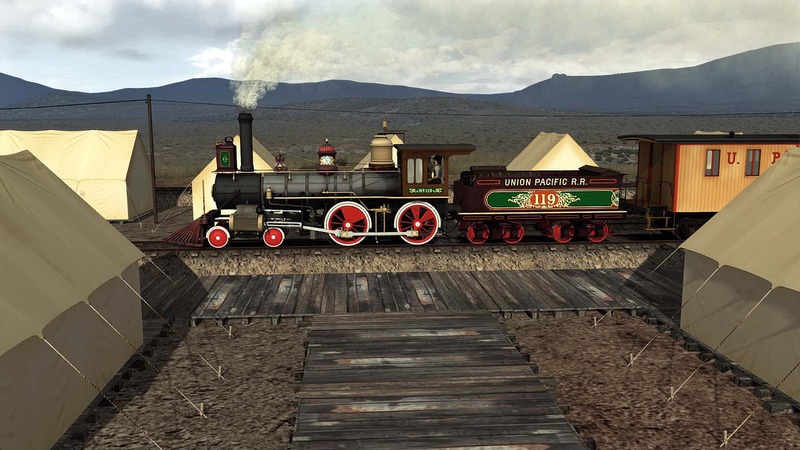 West of Promontory Summit, the transcontinental railroad was constructed and operated by the Central Pacific. At Victory (also known as Rozel), Utah, which was reached by CPRR’s track-laying crews on April 30, 1869, famed Central Pacific 4-4-0 “Jupiter” has freight in town (above), while along the ridge line at Lake, CPRR 4-6-0 No. 86 strides westward with endless and desolate salt flats stretching in the distance. 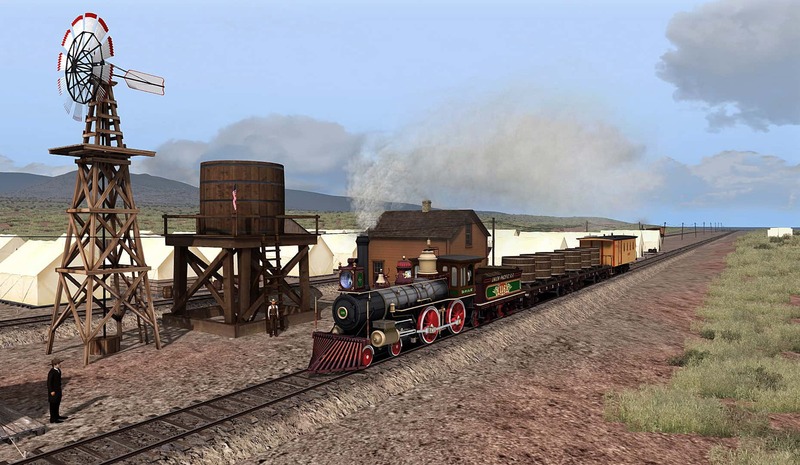 The western end of the Smokebox 68-mile Promontory Summit route for Train Simulator is Kelton, Utah, site of a Central Pacific section station and home to yard and locomotive facilities. 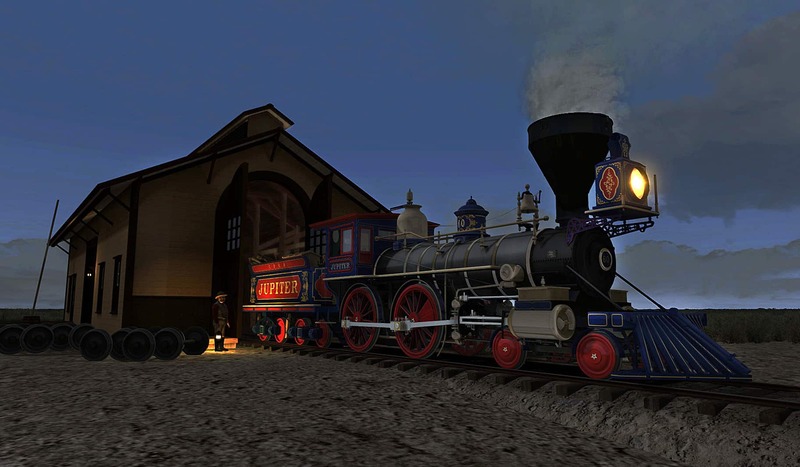 Darkness is falling at Kelton as the beautiful and historic CPRR 4-4-0 “Jupiter” eases from the Kelton engine house. 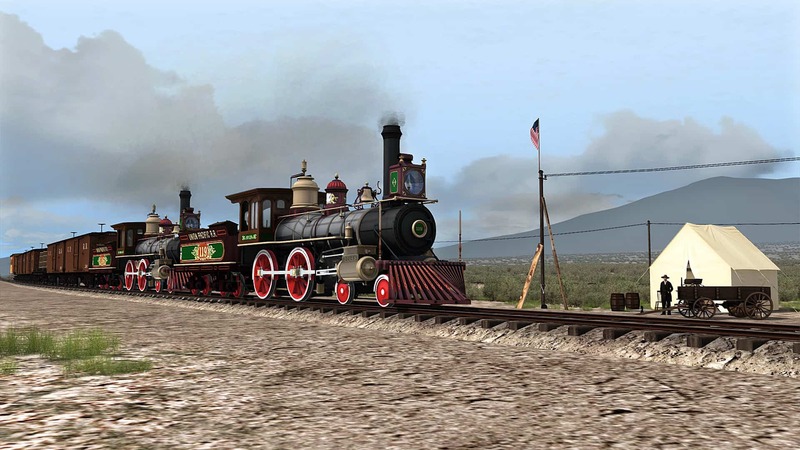 All the remarkable frontier spirit, glory, and challenges of America’s 1869 transcontinental railroad and the rough-and-tumble “Old West” now come to Train Simulator with the 68-mile Promontory Summit route from Smokebox! The Train Simulator Promontory Summit route is now available at the Steam and Dovetail Games Stores!